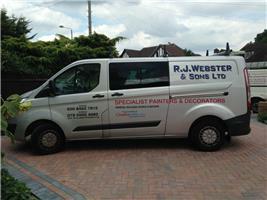 R.J. Webster & Sons Ltd. - Builder, Painter/Decorator based in Bromley, Kent. R.J. Webster & Sons Ltd.
R.J.WEBSTER & Sons Ltd. are a family company established in 1973 who specialise in painting and decorating. We are proud to be one of the longest reigning painting and decorating firms in London with first class tradesman. We are still going from strength to strength and have built our reputation on recommendations. For over 40 years now R.J.Webster & Sons Ltd. has specialised in all aspects of interior and exterior decorating. As part of our dedication to your property we also offer plastering, bricklaying and other property management to ensure the highest quality finish for your budget. For any projects that require working at height we use a trustworthy and reliable scaffolding partner company. Apartment Blocks, Residential properties, Schools, Churches and listed buildings, Hospitals, Hotels, Factories, Nursing & Care Homes, Car Showrooms, Commercial Offices, Public Houses & Clubs, Golf Courses, Function Rooms, Shops and Garages. We offer individual advice to suit your property needs. Please call any time for that personal touch.